I’m breaking with my established pattern and the usual sequencing of the alphabet by looking back at one of my first posts and updating it. I suspect that once I’ve finished the abecedarium (extended with typographical symbols, of course), I will probably revisit several letters, but this one has asserted itself as a priority. I wrote last January about Bohus Stickning, and have finally had the very great pleasure of experiencing Susanna Hansson’s Bohus Stickning class (courtesy of Stitches East, held in Baltimore earlier this month). I am now acutely aware of how much more there is to say on the subject and how much I need to correct in my earlier post. Susanna’s class was so wonderful and there is much to report on it alone, so this post will be less a result of musing on general research and more an appreciation for a really gratifying learning experience. I’m going to try not to repeat myself, so if you’re interested in a general history of the Bohus Stickning collective, please read my earlier post or one of the many, many excellent online pieces listed at the end of this post. Susanna distributed an incredible set of handouts that she had developed over years of perfecting this workshop. The handouts included a very thorough, annotated bibliography, a terrific pattern, and some nice geo-historical information. Her class project, a pair of wristlets, was an ideal way to appreciate the tiny Bohus gauge, the genius of its color combinations, and the lovely visual effect of its knit-purl changes. Solveig Gustaffson of SOLsilke has recreated Bohus-worthy yarns—50% angora/50% wool, dyed to match the five delicate and very particular original colors. So yes, the yarn for this project came to Baltimore via Seattle, all the way from Sweden (and before that, Denmark, where it was spun), and how divine it is! 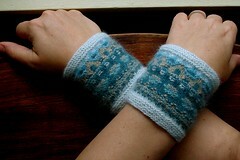 The pattern derives from part of the quintessential, iconic Bohus Stickning design, Blue Shimmer (Blå Skimmer in Swedish), by Anna-Lisa Mannheimer-Lunn. 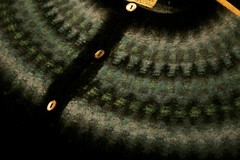 There are some lovely pictures of Blue Shimmer wristlets, hats, and sweaters on Flickr. Blue Shimmer design by Anna-Lisa Mannheimer-Lunn in 1947. As we progressed through the class, the delicate yarns seemed to float into the emerging wristlets, and Susanna edified us with information about the Bohus Stickning collective, its fearless leader, its cultural place in mid-century Sweden, and how all those factors were borne out in the sweaters. Her digital slide show was fabulous—full of remarkable, unpublished discoveries about how people (women themselves and gift-giving fathers & husbands) in America and Sweden acquired their original Bohus Stickning garments, and the place the sweaters have had in their lives ever since. And although it’s hard to settle on one highlight out of so many that day, seeing the selection of vintage sweaters Susanna brought from her collection was certainly it. 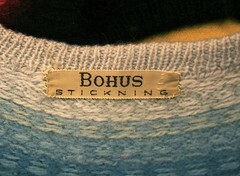 Vintage Bohus Stickning sweaters from the collection of Susanna Hansson. 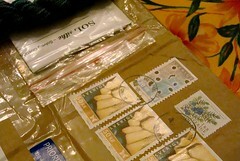 Top right design is The New Azalea, 1963, by Kerstin Olsson, and lower design is Aquamarine (also by Olsson, also 1963). 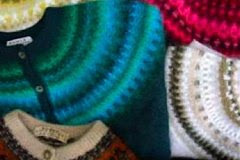 In fact, a major component of the learning process was an archaeological exercise that Susanna had developed to encourage her students to really examine the structure and techniques in all her vintage sweaters, hats, scarves, and gloves. We were given conservation-safe gloves for handling the fragile garments, which gave an added sense of their worth and historical value. A series of questions challenged us to tease out histories for each of them. 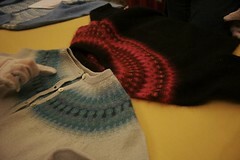 Seeing and “uncovering” the real Bohus sweaters (with Susanna’s guidance, of course) was a remarkable experience on so many levels. It gave me such a palpable sense of the Bohus Stickning collective and its relationship to Swedish (and global) history. It emerged during the war years as a response to dire economic conditions, but came into its own during the heady years of Western excess in the 1950s and 1960s. The sweaters were worn tight and tucked in; the favorites of movie stars and people in the limelight, and fashionistas with very exacting standards who could afford the high prices that went towards paying rural knitters, dyers, wool sorters, and yes, the designers, too. The high prices also meant that women who were lucky enough to acquire Bohus Stickning sweaters really cherished them and valued their gorgeous designs and fine craftsmanship. 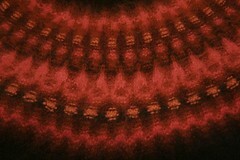 design, The Egg, ca. 1963-65. In the murky land of “before this class,” I had set up a pretty firm mental distinction between Bohus, the technique, and Bohus Stickning, the cultural phenomenon. Susanna, however, did not seem to want to distinguish them. 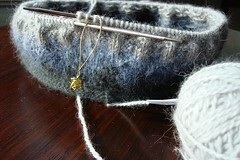 As a firm believer in the precepts set forth by the great Emma Jacobsson, founder and doyenne of Bohus Stickning, Susanna made an excellent case for maintaining the very high standards of the one and only true Bohus: knit at 9 stitches to the inch in angora/wool and after patterns developed by the six designers of Bohus (namely: Emma Jacobsson, Vera Bjurström, Anna-Lisa Mannheimer Lunn, Annika Malmström-Bladini, Karin Ivarsson, and Kerstin Olsson). Perhaps I’m reading too much into Susanna’s ideological stance, but I think there’s something to the concept. Jacobsson worked assiduously to protect both the Bohus Stickning style and the products of the Bohus Stickning cooperative. Diluting the fineness, exquisite color sensibilities, and incredibly high standards does a disservice to the rich legacy left us by the talented designers and knitters of Bohuslän. A garment designed and knit with a similar combination of knit and purl stitches at a more forgiving gauge is beautiful on its own merits, it just isn’t right to call it a Bohus. We should probably find a different name all together for the technique. New Azalea, by Kerstin Olsson, 1963. My big, huge, disappointment of the day was that a number of my best photographs of Susanna’s extraordinary vintage Bohus Stickning collection were corrupted. I had borrowed a nice camera for the weekend, and really should have spent some more time setting it up for the big moment, but I was too excited by the prospect of so much yarn and learning. However...perhaps this photographic tragedy is a sign from God that I must get myself out to Minneapolis for the event of the season: the opening of “Radiant Knits: The Bohus Tradition” in January. Yes, that’s right: there will be a Bohus exhibition in my very own country, featuring many pieces from Susanna’s extraordinary collection, sponsored by the Minnesota Knitters’ Guild, and mounted at the American Swedish Institute. The opening weekend in January will bring together Bohus re-creator Solveig Gustafsson, foremost teacher of Bohus Stickning Susanna Hansson, filmmaker Kjell Andersson (and his film, “Bohus Knitting – From Relief Work to World Success”), original Bohus designer Kerstin Olsson, and American dyer and Bohus yarn producer Mary Jo Burke. In addition to her tantalizing description of the exhibition, Susanna let it be known that Solveig Gustafsson is likely to release some new kits expressly for the exhibition, including (possibly, it must be said!) New Azalea, which was my favorite of all the scrumptious sweaters Susanna brought to Baltimore, and will certainly top my queue when it’s available as a kit. Earlier this week, the makings for my very own Bohus sweater arrived from Sweden, on the very same day as an invitation to the opening of the exhibition in Minneapolis. Bohus Boon Day! I shouldn’t have photographed the yarn at all, because it’s really a gift for me, destined for a place under the Christmas tree. I shouldn’t have, I shouldn’t have, but how could I possibly not open this box with all its promise and check to see that its contents were all in order? The pattern is called Gray Mist, designed by Kerstin Olsson in the early 1960s, and inspired by a Paris fashion show that featured subtle, graded tones. 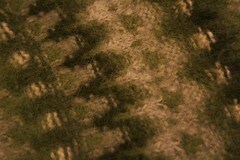 Olsson designed several “mists,” each with a slightly different hue: Gray Mist, Green Mist, Brown Mist, and Gold Mist. The main color in Gray Mist is a dark gray—not quite charcoal, but with a slight tendency toward green. The other colors tend toward blues and one is decidedly periwinkle. But how could I possibly know all of this, having merely glanced at the contents of the box? What a delicious prospect for Boxing Day. The new kits that Solveig Gustafsson has created for the exhibition, Radiant Knits, are now available via the American Swedish Institute’s online shop, Shop Swedish. Newly re-created designs include: Gothic Window (in blue and pink), Blue, Red & Turquoise Light(s), Rime Frost, and New Azalea, in addition to other wonders: Blue Shimmer, Swan, Large Lace Collar, Green & Gray Mist(s), Forest Darkness, Green Meadow, and Wild Apple. I believe Gold, Scilla, Blue Flower, the Egg, Sago & Red Palm(s), and Yellow & Rose Lace Collar(s) are only available via SOLsilke. 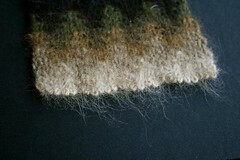 Slice of a Bohus Stickning design with live stitches showing the yarn’s angora content. A few choice pieces from Susanna Hansson’s extraordinary collection. Great post. It was so fun to read while working on my Forest Darkness. 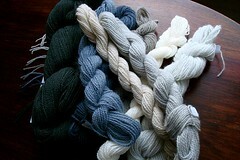 I have to side with Susanna on keeping the term Bohus knitting true to the original designs. I've heard her suggest the term, Bohus-inspired, for patterns at different gauges or created in the spirit of Bohus knitting. I look at it as a fashion label - you don't say you are sewing a Chanel jacket unless it is a close copy of an actual Chanel design, but there are plenty of Chanel-inspired patterns. That analogy makes me wonder if even our modern reproductions shouldn't be called Bohus reproductions, and not Bohus. Let's ask Susanna in January! Merry Christmas - it is sure to be a special one for you. Bohus bonus is a bonus! 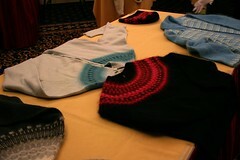 I would love to see some of these garments up close, it makes me want to travel to Minnesota. 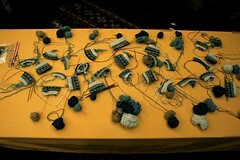 Wow, this A to Z knitting project is genius! I will be posting about it on our UPPERCASE journal tomorrow for our Type Tuesday theme. Thank you so much for this update on Bohus; it is always a treat to read you. I agree with Susanna too, especially after having knitted the Large Lace Collar. The subtlety of the colors would be lost at a larger gauge, which does not mean it can't produce wonderful garments as is DancesWithWool's Merry Sheep's Reel.